Mms dx by hot toyshot toys is proud to announce their brand new product line - mms dx (movie masterpiece series deluxe) - and dc direct is proud to announce the first in the line is the debut of the joker from the dark knight! The mms dx line features a newly developed technology for a 1:6 scale collectible: parallel eyeball rolling system (pers). Pers special features include: unique designed eyeballs with colored translucent iris and simultaneous positionable eyeball function. The eyes for these figures move in all directions, much like human eyes. 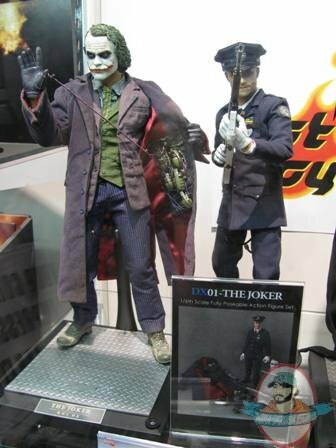 The joker mms dx stands approximately 12 inches talland features the hot toys true type body with over 35 points of articulation. Dressed in a gotham city police uniform with hat, gotham city police badge and shoes, it is an authentic reproduction from the scene in the movie. an additional costume: the new, improved&movie-accurate costume of an overcoat, sport coat, vest, shirt, tie, pants, belt, socks and shoes, with grenades rig and suspendersdeluxe figure stand with led lightspackaged in a 4-color box. Limited edition!